We still have a long vacation coming up in August. As a friend said recently, “We’ve taken ‘trips’ before but this is going to be a vacation!” We’ll be spending two weeks away from home traveling to the Black Hills of South Dakota, Yellowstone, and Estes Park/Rocky Mountain National Park (plus a stop at Grandma’s house on the way home). We’ll be doing some tent camping, as well as a few nights staying in cabins. It should be quite the adventure. And it involves 40 or so odd hours of driving! Needless to say, I’m trying to be very well prepared for our time in the car so that we aren’t tempted to have the kids zone out to waaaay too many DVDs. Sure, we’ll probably watch a few movies. But I think we’d like to keep it to one long movie or a couple shorter shows per driving day (We have four 8-9 hour driving days, plus one 5-6 hour driving day planned for our trip). 1. Audio books: Miss M has enjoyed audio books for several years (though she hasn’t listened to many recently), but in the past the boys never really wanted to listen. We tried a short, fun audio book on a trip to Chicago earlier this summer, and everyone really enjoyed it! I’m requesting several audio books on CD from the library for our trip. Some are long, some are short. That seems like a pretty easy way for us to do it in the car, but our library also offers downloadable audio book loans as well, and there are many great free audio books available for download at Librivox.org. 2, Individual “Snack Packs”: On short trips we just play “toss the snack” to the back row and hope it doesn’t spill or fall on the floor. But a long trip calls for a different solution. I have seen some super cute “snack box” ideas on Pinterest, but we keep it simple around here. Each kid gets a brown paper lunch bag, and I fill it with snack size baggies or other individual snack items. Hungry kids can help themselves and perhaps the adult not driving can even sleep for a bit without being interrupted by “I’m hungry” (maybe). 3. Personalized coloring/activity books: Before the trip I’ll ask my kids what kinds of coloring pages they are in the mood for, and I’ll print some out from the vast reaches of the internet. The kids also like mazes, and Miss M might be up for some other printables like crossword puzzles or word searches. I saw the idea on a blog (but I can’t remember where) of including maps of each section of the trip to give kids an idea of where you’ll be driving each day. I’ll bind my kids “coloring books” with a pro-click spine, but binders work too (that’s what I did before I had the proclick). 4. Printable games to play: I’ve found some great travel game printables on Pinterest. I already have a few games printed and laminated from previous trips, and I’ll probably try and print out a few more before our upcoming vacation. These will get packed in a large baggie or three hole punched and stuck in a binder, along with dry erase markers. We could try some travel-size non-printable games…but I’m not sure my kids would do well not losing pieces at this point! 6. Cut down on “Are We There Yet”? : This is going to be a new area of effort for us. Since this trip involves a lot more driving than usual, we’ll need to help the kids not ask that question that all parents dread hearing. 😉 We might use a combination of something to mark the passing of time (like a road trip countdown or a piece of tape with sections marked off for each hour of the trip) and maybe some kind of “prize” for the kid that asks that question least often! 7. Pack a few “crafty things” to keep the kids busy: I love the ideas in this post at 123homeschool4me. From cereal lacing necklaces to foil creations to beads on pipe cleaners, there are so many little things you could pack away to use on a trip. This will take a bit more effort and planning on my part, but hopefully I could pull at least a few ideas like this together. Those are most of my great ideas for what to do while we are in motion in the car. Do you have any more ideas I should add to my list? …A School Room that is. We have one…but it hasn’t been used for “school” nearly as much this last year as it was at first. When we first moved into our current house, Miss M was just beginning Kindergarten. Being that all three of our kids (at the time) shared one bedroom, there wasn’t much room in there for toys. Our other main-floor bedroom was a playroom/schoolroom. 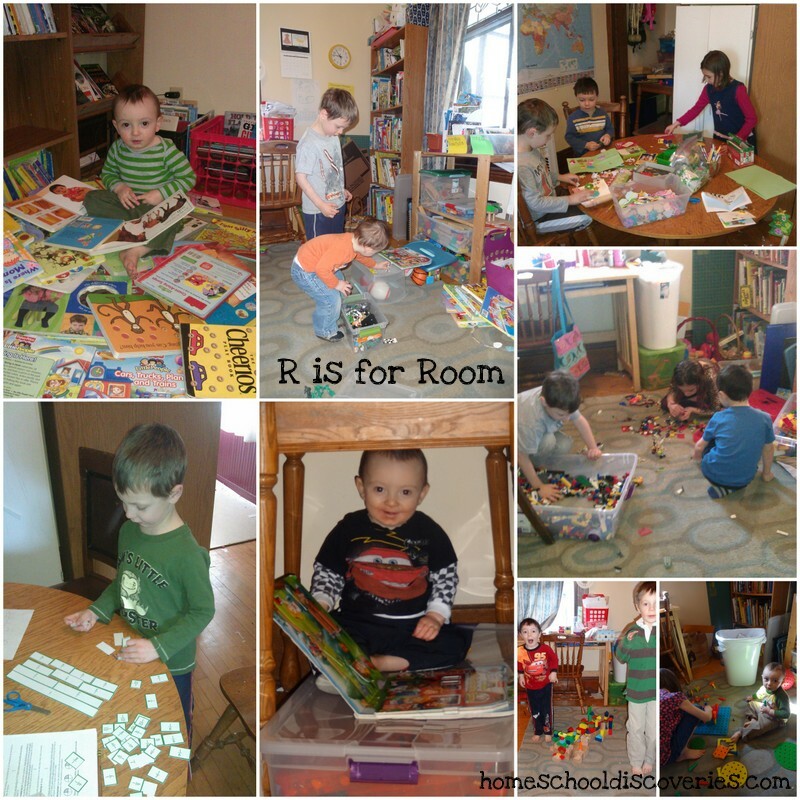 By January of 2012, Miss M now had three younger brothers instead of two, and she was ready for her own room. We were also ready for the school room to be a bit quieter place. So Miss M moved upstairs, and the playroom/schoolroom became a mostly school room, with a few quieter toys. Here’s a blog post about our overhaul of the play/school room. This past year, Miss M started doing more independent work — most of which she did at her desk in the school room. I also found myself often working with Mr. E while Miss M worked independently — and our talking made it difficult for Miss M to focus. I had to look all the way back to October to see a school-work “action shot” taking place in the school room (not counting Miss M working at her desk, which she doesn’t really like me taking pictures of). Meanwhile, Lego play has become more and more of a “big deal” for the two older boys. And the Legos are in the school room as well. It’s a catch-22: They are in the school room distracting the big sister…or they are in the boys room with the toddler (and then we either have to keep the toddler out of the room with all his toys or allow him to run amok with the Leogs!). So, they stay in the school room most of the time, and sometimes we make a rule that they cannot come out until school is done for the day. But that’s hard for the boys since they are done with their school obligations much earlier than their big sister. We did almost all our non-independent school work at the dining table this year. But all the books are kept in the school room! We ended up many times this year with either a large school room occupied by one 3rd grader doing school work…or a large school room occupied by no one doing school and instead occupied by boys playing blocks or Legos or by a toddler noisily pulling books off the shelf. I haven’t really figured out the solution to this problem yet. I would love to find a way to move Miss M to a different spot in the house for her independent work…but she is the type who does not like change and is resisting the idea of being anywhere else in the house. I’m glad we aren’t starting back to a full schedule until the day after Labor Day this year — because I still need some time to figure this out! I’m finally caught up on my alphabet posts and I’m linking up to Blogging Through the Alphabet this week at Ben and Me! I’m also linking up to the School Rooms post at the Not-Back-to-School Blog Hop! With only one student doing a Logic of English program, organizing the phonogram flash cards was pretty simple. I kept a pile handy of the cards we were working on, and the rest were in a drawer in a baggie or held together with a rubber band. Even adding a second student, Mr E, didn’t cause too many problems at first because I was going through the Essentials program very slowly with him and not using too many cards. At this point I also wasn’t making very good use of the spelling rule cards, so those just sat mostly unused in another bag. But chaos broke loose with my phonogram cards once I started Mr. K in the Foundations program and transitioned Mr. E to this program as well. Now I had stacks for cards Mr. K was using, cards mastered by Mr. E but not by Mr K (but that Mr K will need in upcoming lessons), cards currently needed by Mr. E, cards needed by Miss M, cards Miss M had mastered but were not needed yet for Mr E and finally cards no one is using yet (but of course Miss M will need in the upcoming weeks). Oh, and plus those spelling rule cards! Whew, that’s a lot of cards! The Logic of English flash cards are a bit of a challenge to organize because they are bigger than typical 4×6 cards, and are also too wide to fit in many of the other random plastic boxes I had around the house or could easily find at Target. After much searching online and asking for advice on forums, the best option I came up with at first is the box I purchased (see the picture above — or here on the Target website). I liked the fact that the game cards also fit in the box, but I was a bit disappointed not to have a storage box with a lid! I’ve found what I think will be safe place to store the box so that it’s less likely to be tipped over by our curious toddler. In order to avoid buying special large divider cards, I made some using cardstock — I just needed to trim a bit off the side of a standard letter-sized piece, and then cut each piece in half. I then hand-cut the tabs (as I’m sure you can tell from their uneven sizing!). As of right now the game cards aren’t very well organized. 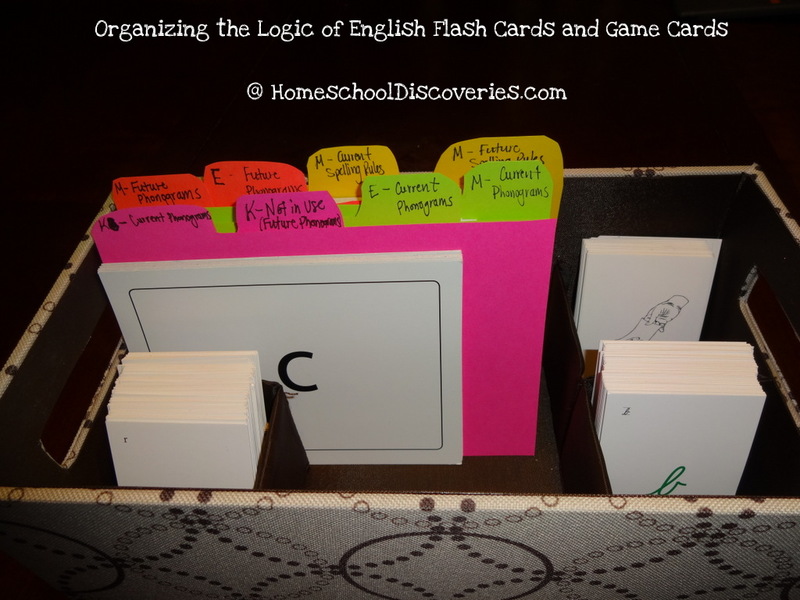 They are just separated into three groups – cursive, bookface, and special cards. A project for a future day would be to organize them better by who might use them for a game. But what about the “bad days”? Not all “bad days” are created equal. Sometimes I’m the one having a bad day. I often find that a quick prayer for extra grace, followed by a cup of coffee, puts me back on track. A fifteen minute catnap while the baby is sleeping and/or while all the kids watch an educational video or play a game on the iPad can also work wonders. If one of the boys is having a bad day, it usually just means extra patience is needed for me, and for Miss M. I might have to delay working with Miss M while I deal with discipline issues or give one or more of the boys some extra TLC. Since Mr. E is only a Kindergartener, I can easily drop any academic expectations I have on a particular day if it seems more worthwhile to just snuggle up and read or let him play legos. We try not to let that be our pattern, and it is really the rare day I drop school all together for him. The real sticky spot in our schedule comes on those not-so-good days for Miss M. Maybe she woke up on the wrong side of the bed, got distracted by what the younger siblings are doing, isn’t “in the mood” for school, is getting hungry (but forgets to stop for a snack) and/or is struggling with an assignment yet having a hard time communicating that fact in a polite way. On a day like that, procrastination or s-l-o-w work is often an issue. In that case, perhaps only one or two things from her independent work list have been completed by the time the boys are ready for a break (or even finished with their work)! I’ve learned that with Miss M, exhortations to “hurry and finish up” generally make things worse, and as much as I think discipline and work ethic are important, trying to “make” her do her independent work is usually pretty counter productive relationally and otherwise. Miss M strongly prefers to finish her whole list of independent work before we work together. But that has also led to days when I was essentially waiting for her while she dragged her feet on her list of assignments. After a particularly trying day recently that involved me doing a spelling lesson with Miss M in the very late afternoon (when we were really both too tired for it! ), we came up with a compromise — by 11am I can ask her to start our work together if we haven’t started it already. Most days, Miss M should be able to finish her independent work easily by this point or before. But if she chooses to dawdle or be distracted…we will work together at 11am anyway (give or take a few minutes…since strict time schedules rarely work that way!). Her independent work still must be finished later — even in the evening if needed. It’s amazing how fast that work can be completed when there is a motivation of potentially missing out on something fun! How do you deal with the “bad days” in your homeschool? I’d love to hear your insight and suggestions! I can’t imagine myself ever becoming a food blogger — I take lousy food pictures and rarely, if ever, make up my own recipes. I do, however enjoy menu planning and cooking (at least most of the time). And of course menu planning is a big time saver (very necessary with four kids and needing to spend a good part of each day educating them!). So, I was pretty excited when I saw that the topic for our monthly homeschool support group meeting was going to be “Organization in Cooking Meals: Meal Planning to Help Free Up Our Homeschool Days.” I love to both share things that I’ve learned about meal planning and learn from others as well. The magnetic frame is a freebie I got years ago, and each January I print out a new year’s worth of calendars to put on the fridge. I’ve used these monthly calendars in various ways over the years — sometimes filling in a month at a time, other times filling in just a week or two at once. But whether I do it once a month or once a week, it still takes a lot of time and energy to pull out my menu planning inspiration (lists of favorite recipes, my binder of recipe print outs, and my laptop full of bookmarks and Pinterest recipe pins, etc), and decide what to fill in each menu square. So, I decided a few months ago to try something new. 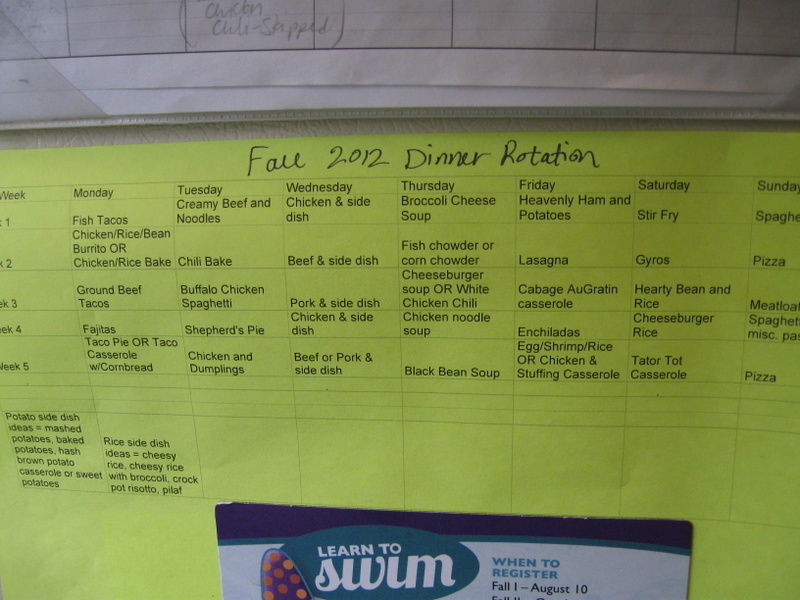 I created six weeks of menus for summer back in May, and rotated through those for four months. Then at the end of the summer I created a five week menu rotation for fall/winter that I hope to use for at least the next four months. 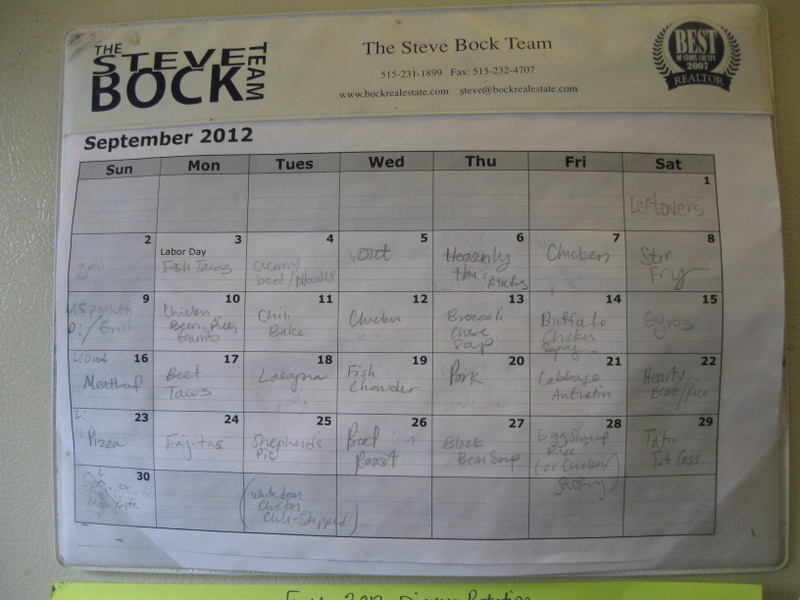 At the beginning of the month I use this menu rotation spreadsheet to fill in the monthly calendar (in pencil, of course!). If there are certain nights I know at the beginning of the month we will definitely not be eating at home, I just skip those meals from the menu rotation, making a note somewhere that I skipped them in case I need meal inspiration some other day — perhaps a day we’re just not in the mood for something I had planned, or if I end up not finding a reasonable price on the ingredients for another meal I had planned. Using this method I am not only saving time in menu planning, but I have a better likelihood of saving time when grocery shopping as well. I didn’t try this at all over the summer (and I had more time then, since we weren’t doing full school days!). But in the interest of saving time, I attempted to purchases as many groceries as possible at the beginning of the month! Sure, I still have to run into the store for milk and produce, but that takes much less time and stress than buying a week’s worth of groceries! Having all my meat for the month also allowed me to do a bit of freezer cooking — At the beginning of the month I cooked enough ground beef and shredded chicken to use for all the meals in this five week menu! I’m also trying to do just a bit of other freezer cooking — doubling a meal here and there. But for now, I’m pretty happy just to have most of my groceries on hand and some already-cooked meat in the freezer! So, what about sales? With my limited time right now, I am not doing double couponing or looking for the loss leaders every week — I’m mostly going to Rainbow for double coupons when I need cereal. If I happen to find time for a special sale on some other items, great! I can incorporate it into my current plan or save the item for a future month. I am doing most of my shopping at Aldi, which has pretty consistently low prices on most items I buy. I’m sure I could do a bit better on overall spending, but my hope is that I’ll save money by shopping less often…and of course my time is valuable too! I’m so thankful to be a homeschooler in the internet era. It’s hard to imagine homeschooling without the resources, ideas and support that come from the many sites dedicated to or just available for homeschoolers to utilize. 1. Pinterest. Yep, most of you reading this have probably jumped on the Pinterest bandwagon already. If you haven’t (and you think you can use at least a little bit of self-control to not spend too much time there! ), you should check it out. Think of it like a virtual bulletin board — you can use it to save favorite sites/pages in whatever categories you choose (and then you have a handy visual reminder of these sites you want to visit again!). You can also search or browse through “pins” that others have saved. 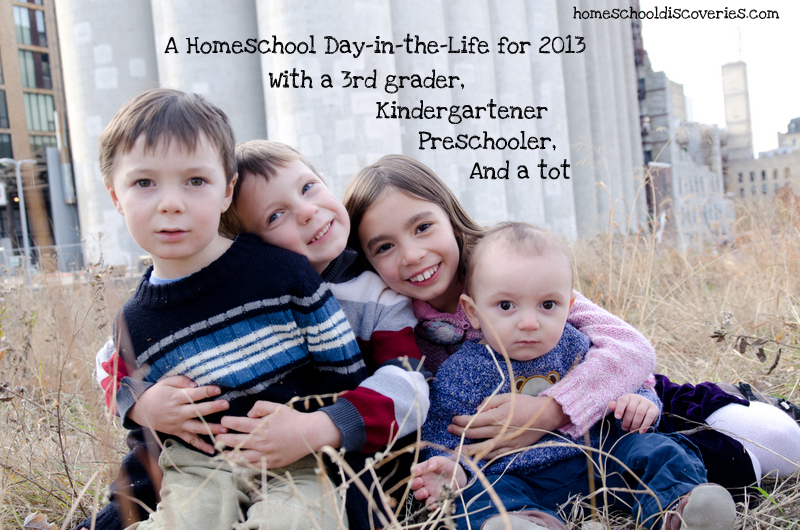 I love following other homeschoolers and seeing what great finds they pin! I’ve found some really great ideas and useful resources here. If you are looking for more homeschoolers to follow on Pinterest, check out this link-up — Over 400 homeschoolers have listed their Pinterest url’s in this link! 2. Homeschool Classifieds. Looking to save a bit of money on curriculum by buying used? I’ve had great luck finding things I’ve been looking for here. I’ve never had any problems either buying or selling here (use common sense — it’s not like there might not be a few spammers or scammers hanging out there! ), and it helps stretch my homeschool $$. 3. Homeschool Share. This site is full of free lapbooking printables. They also have unit study resources, “five in a row” resources and kindergarten kits! 4. A Book in Time. Looking for books or crafts to go along with world history or American history studies? A book in time has many resources, sorted by era. 5. ClipArtETC. This is a relatviely recent discovery for me — it’s a great source for all kinds of educational clip art. Be sure to check out their Maps site as well! 6. Books Should Be Free. There are quite a few sites dedicated to free public domain ebooks and audio books, but this one is easier to browse than some of the other sites. If the public domain book you are looking for isn’t here, check out Project Gutenberg, LibriVox (audio books), Lit2Go (audiobooks), and the Baldwin Project (online children’s literature). 7. Jimmie’s Squidoo Lenses. Jimmie has created tons of “lenses” (fancy squidoo term for a webpage filled with links and info about a certain topic) on Notebooking, Lapbooking and more. When I am looking for a lapbook on a particular topic or advice on notebooking, I find myself on one of her lenses quite frequently! 8. 1plus1plus1equals1. This site with a funny math problem for a name has some of the greatest printables for tots through Kindergarten age. Carisa has put a lot of time into creating wonderful, free tot packs, preschool packs and so much more. Following those links to her site will get you links to several other sites with free tot/preschool packs as well. 9. Paula’s Archives. While not as fancy and modern looking as some sites, Paula’s Archives is packed with useful info on living books for history and science, movies for history, tips and ideas to entertain toddlers during school time, lunch ideas and more. 10. Guest Hollow. I found a lot of inspiration from this site’s free American History curriculum as I created my history curriculum for this year. Besides two years of free American history plans, Guest Hollow features free curricula for ancient history and various science topics, as well as notebooking pages and other printables. Those are just a few of the many sites that I have found helpful! The homeschooling community on the internet is so wonderful, and there are so many free and low-cost curricula and tools for all of us to enjoy!